Slow Cooker Salsa Chicken Black Bean Tacos are an easy and delicious Mexican meal any night of the week. They are also a great option for gluten free Cinco de Mayo food! #SundaySupper is slowly easing into 2014 with a menu of recipes to make in your slow cooker. With only three basic ingredients (plus a few shakes of some spices), this recipe makes it easy to feed the family for dinner on a busy night, or the whole gang you have over for the big game. You’ll be all ready to make a taco bar, rice bowls, burritos, nachos, and more. Fire up the crock pot to make a salsa chicken black bean mixture that everyone will love! Do you have a deep freezer or chest freezer? I swear, those things are like a food abyss. Things go in and mysteriously get sucked into a parallel universe, only to reappear when they are well past their expiration date, or a freezer burned beyond recognition. It’s like The Matrix for food. Mine currently is home to a small stash of milk for the baby and frozen cubes of homemade baby food. And frozen shrimp, for when I need a quick meal. Plus gluten free bread, and breakfast sandwiches The Hubby always buys at Costco. And a dwindling stash of mini muffins that The Bug is still willing to eat, even though they have become a bit dry (mom of the year!). Oh, and some various and sundry cuts of chicken and beef that I stock up on when they are on sale. Well, I should say it was home to all of those things a couple months ago. Then I had to start making Christmas cookies and candies and treats and twelve dozen pierogies. Soooo, I had to start a conscious effort to use up some of the inventory in order to fit everything that I would be making. Such is the life of a food blogger, I suppose. We’ve made a pretty good dent, and now that the holidays are over, we are down to one remaining dozen pierogies, a few random cookies that I’ll be sending into work with The Hubby (I’d rather sabotage their New Year’s resolutions than my own), and a dwindling supply of baby food cubes. Except that all the space that the goodies were taking up are now being filled with an ever-growing layer of ice from opening the freezer eleventy-billion times. Which means it is time to defrost the freezer. That is even scarier than digging through to find something to make for dinner. I’m totally expecting to find something that expired in 2004. Fun times! We’ve mainly been using it to make tacos, but The Hubby threw together a rice bowl a la Chipotle, I’ve made taco salad, and when I made a ginormous batch (yes, you can easily double or triple the recipe if you have a big crock pot) for New Year’s Day, I saved some leftovers to make salsa chicken enchiladas. 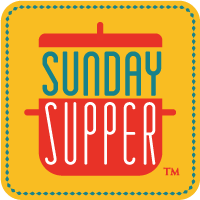 And make sure you check out all of the deliciousness coming out of the #SundaySupper team’s slow cookers at the bottom of this post. Tell me I am not the only one who has food disappear into a freezer abyss. Enjoy these slow cooker salsa chicken black bean tacos! Taco fixings - tortillas shredded cheese, lettuce, sour cream, guacamole, etc. Season your chicken with salt, pepper, cumin and chili powder, as much as you like depending on how spicy you want your chicken, and how spice your salsa is (I usually just use a little sprinkle), and place in your slow cooker. About 20-30 minutes before you plan to eat, shred the chicken with forks, add the black beans, and mix everything thoroughly before replacing the lid. Serve with your favorite taco, nacho, rice bowl, or salad fixings. Double or triple to make a big batch for the whole gang, or to keep in the freezer. In addition to my salsa chicken black bean tacos, the #SundaySupper team has you covered to slow cook any meal! I’m always on the hunt for easy and healthy recipes that don’t have an ingredient list a mile long. I made this and it’s OUTSTANDING! The best recipes are often the simplest ones. Thank you, thank you! I’m so glad to hear that you enjoyed the tacos, Lauren. Thank you for your comment and for rating the recipe! Can I use frozen chicken ? Some people don’t recommend froze chicken in a slow cooker for food safety reasons. I’ve done it and been fine, but that’s really your call. You would just want to cook it on high. Is it possible to throw in frozen chicken with this recipe or need it be defrosted first? Sounds delicious! Absolutely, Aileen! Toss them in… it sounds like a delicious idea! Hi! I made this last night and added more veggies to it. It was a hit at my house! Would you mind if I shared your recipe with my additions on my food blog if I give you credit for the original with a link to your recipe included? Great idea! Thanks for helping us moms out! So glad you liked it. Yes, that would be fine, and I love that you added extra veggies! I’ll have to do that next time! Thanks for stopping by, and I soo agree – the slow cooker is a lifesaver! Thanks! Yes, can’t get much easier! My freezer is a very scary place. I think I should simply go to the store and buy some fresh chicken to make this fabulous dish. At least, I know we will not be ill from expired chicken and that we will all enjoy a delicious meal! I’m glad I’m not the only one who’s freezer seems to get crowded with things and things stay in there way longer than they should. Brilliant way to use up the salsa and black beans hanging around in the pantry (which is another issue like the freezer). You have no idea with the beans and other canned goods. My hubby insisted on stocking up for an emergency, and I don’t even like canned veggies really, so we have cases just sitting there. I have been afraid of my crock pot for a year so it’s sat useless in its box on a high cabinet. I made this recipe as my first foray into crockpotting last night and just had it for lunch. AMAZING! So delicious and so simple! 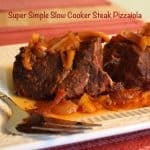 Please share your other favorite crock pot recipes! Oh wow, that is so awesome! So glad I could get you to use this super-helpful appliance and try something new. Here is my Slow Cooker Obsession Pinterest board. All of my crockpot recipes are on there, plus others that I pinned that I think look awesome. Aww, thanks Kim. I don’t feel I am as good at writing about the food as other people, so I like to tell stories. My blog has sort of become my journal. This looks like a great recipe, so easy too!! Some days you just need to throw together a couple of simple ingredients so that you can come home to dinner! Smart to put everything in one pot and set it and forget it….until dinner, that is! I bet this would be great on potatoes too! Mmm looks so good! Ooooh, or sweet potatoes! Everyone’s comment are giving me great ideas! Ugh, I hear you on the freezer abyss. I don’t even have a chest freezer – just a normal one that is crammed to the gills. The worst is freezing something that you KNOW won’t make it out edible. You KNOW you’ll be throwing it away in 6 months. Yet I keep doing it. hahaha. 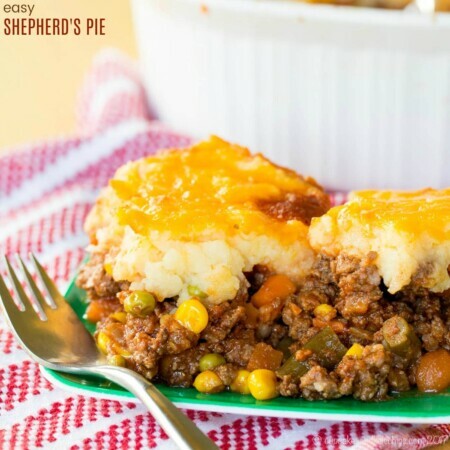 This is such a great, versatile recipe to have around. 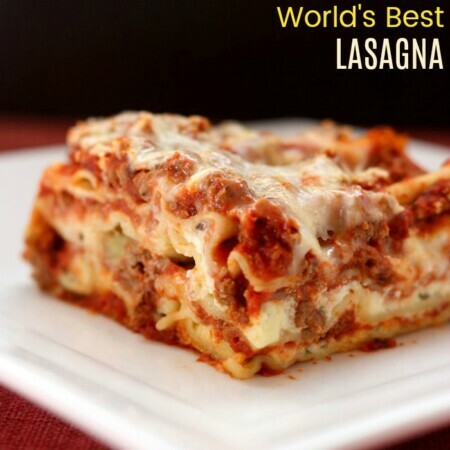 I could make it a big batch of this and eat it three different ways, three days in a row! Haha, that sounds like my mom’s freezer! We actually had tacos one night and enchiladas a couple of nights later. I have some left in the freezer, too! My kids love making tacos! 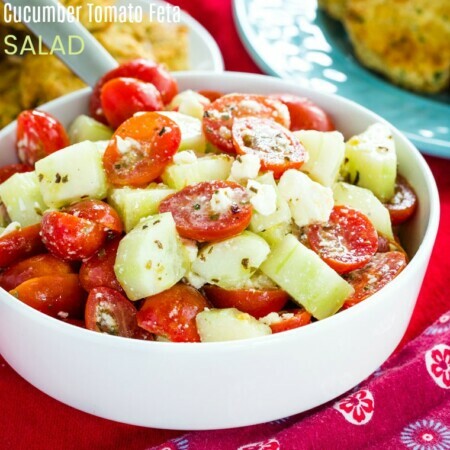 This is a great recipe for our busy weeks and yours looks delicious! Thanks Isabel! Definitely a keeper for years to come when I have to feed two bigger boys (and all of their friends)! Mmmm….I could see some of this mixed into some scrambled eggs too. Breakfast burritos! That’s an awesome idea, too! Our deep freezer is a disaster. I really need to clean it out, but just haven’t made the time. That’s really the last thing I want to do when it’s already below freezing outside! These tacos are just our style–simple, a little spicy, and a healthy meal for a weeknight! I am hoping it is a bit warmer when we need to defrost next weekend! 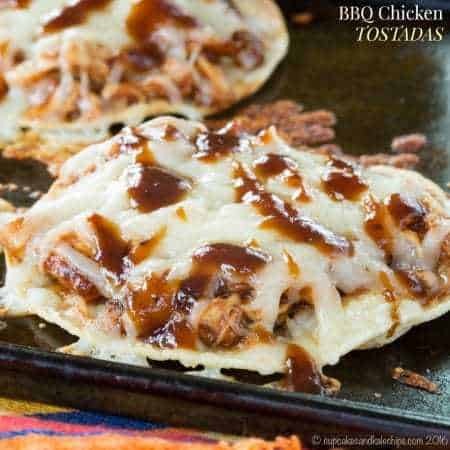 This is PERFECT for a playoff/Super Bowl menu…make a big slow cooker of this meat and bring chips, tortillas, and fixings and let everyone make their own creations! EXACTLY! That’s what we did for New Year’s Day and the bowl games! Yum! It always amazes me how tender chicken comes out when you cook it in the crockpot. It’s perfect for tacos! Yes, definitely one of the best ways to cook chicken! This is right up my alley! Looks terrific! Thanks for posting. What a great way to have taco filling ready to go at the end of a busy day! Your salsa chicken looks fantastic! Exactly, and always good to have leftovers in the freezer! HaHaHa! I can so relate about my basement freezer being a food abyss. Thankfully I just cleaned mine out before the holidays so I’m starting with a clean slate for the new year. I give me about two months before it’s back to being a freezing, black hole! Anyway, I digress. Your tacos sound super flavorful and easy. 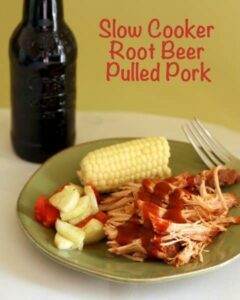 My kind of slow cooker recipe! Defrosting ours is on the calendar for next weekend. One more week to finish up the last bits of baby food before I defrost and make a new batch. I love making recipes like this in the crock so you can have some yummy shredded chicken for any recipe later that week! Now I just need to do it every week! I too have a freezer in the garage that I have tons of frozen soups and sauces in and I always forget about them!! Yes! I threw a little more of the leftovers in the freezer because now we are getting a bit bored of it. I love chicken tacos, but my Husband doesn’t, what a weirdo! I love that you added black beans to it! I think I need to make this just for me!! I don’t mind eating this all week and for lunches!! The black beans really help stretch it further. Hmm, maybe he would like it with rice, or maybe even as a sandwich! Such a flexible and delicious recipe – my girls would have it as tacos and I would have a soup. Chuckling because I dread going out to my freezer these days. I definitely need to make up some recipes with the back log! Thanks Marjory. Hmm, you’ve given me an idea for the little bit that is leftover. I could stretch it into a taco/tortilla soup. Brianne these look so good I’ll have two please! Absolutely, I still have a little bit of chicken leftover!